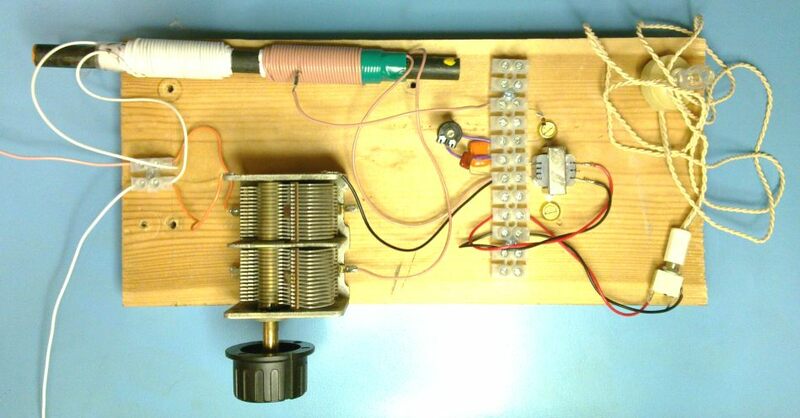 Update September 2011; If you're looking for a kit of modern parts that will reproduce the design below quite closely I recommend the Useful Components Choccy Block Crystal Set Radio Kit. In another page on this site I describe how to make a pretty good loud crystal set which I'm calling the version 1. This uses fairly high impedance, fairly sensitive magnetic headphones, an OA81 diode, a transistor radio ferrite rod and some other parts that were a bit awkward to find. 1 LT44 interstage audio transformer. 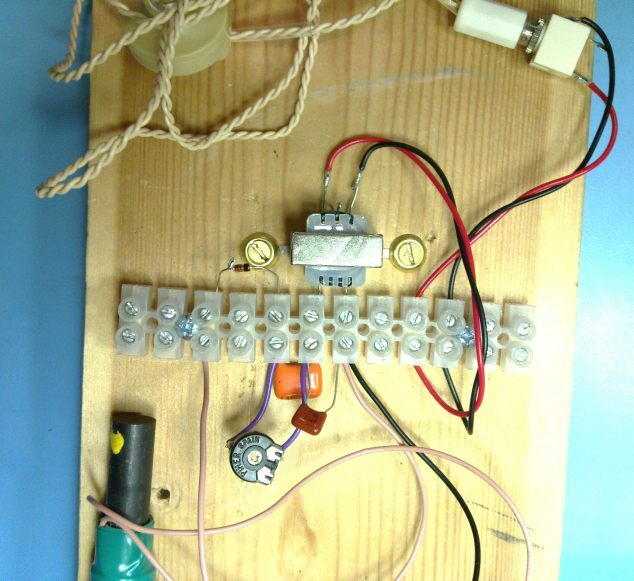 As a kid I played with crystal radios using the little brown crystal earpieces and various circuit configurations with some limited and variable success, but always with quite poor aerials. I couldn't reproduce this limited success using my V1 set and a wire aerial sloping down from an upstairs room to the end of the garden, a mere few metres. This suggested to me that I might be able to get something even louder going using those crystal earpieces, even if they are a bit uncomfortable. I'm calling them crystal earpieces, and so they used to be. When I took one apart in the 1970s they consisted of a light foil diaphragm with two stiff wires leading from the wire terminals to what I assume was a piezo crystal lump, bonded to the middle of the diaphragm with glue at the apex. The new versions contain something which is more like a standard piezo sounder element so might be more accurately described as ceramic earpieces. I suspect that they will have more capacitance than the old ones, which I can't confirm without finding a vintage part. They do seem to work just as well as the old ones though, and are probably more consistant. Like the V1 circuit this consists of three coils fitted onto the ferrite rod in such a way that they can slide up and down on it. The reasons for this and plenty more discussion besides are dealt with on the V1 page, so let's deal with the differences here. First, we're using a ceramic earpiece because they are very sensitive and you can buy them easily. I measured a few of these and they are about 27nF capacitance with very high resistance at d.c. At 1kHz, the audio mid-band this is about 6K Ohms impedance. That's quite high, though not high enough to go connecting it directly across the tuning tank. Normally you'd need a resistor connected across it to bleed away the d.c. offset generated by the diode and that makes it a bit less efficient. Here I tried using an LT44 audio transformer instead. This provides a d.c. path to ground for the diode, multiplies the impedance of the earpiece up still further and by coincidence, provides just about the right inductance to resonate with the capacitance of the earpiece at 1kHz. This is a fortunate coincidence indeed, if you're looking for loudness and aren't too bothered about the audio being a bit tinny sounding. When measuring high impedance side of the transformer at 1kHz it actually increases when you connect the earpiece load up to the low side. Across the high impedance side of the transformer there is a 1nF capacitor. I wasn't expecting to need this, but at low signal levels it increases the volume significantly. A bit of a mystery that. Feeding into the top end of the transformer there is another difference to the V1, that being the inclusion of a d.c. resistor shorted across with a capacitor. These two components together are colloquially known as a "Benny" which I believe is after their inventor and nothing to do with Crossroads. The idea is that the diode works better when the d.c. current is equal to the a.c. current, so you adjust the variable resistor for maximum volume after tuning in your station. It makes no difference at low signal levels, but when you get a decent aerial erected it really does work. I had been very puzzled by this effect when I'd come across it when playing with the V1 set. The diode is conventional and you can insist on using a germanium point cantact type if you wish, but I've found that silicon low Vf BAT48 schottkys and 1N60s are just as good, even at low signal levels. The picture shows small parts on the circuit mounted in a handy 2A terminal strip "choccy block" block. You can guarantee that the insulation between the terminals on these are low loss, which is not necessarily the case if you are trapping the wires under screwcups screwed into variable wood with unknown properties. Why bother with the audio transformer? Why bother with the audio transformer when the earpiece is 6KOhms at the frequency of interest and moving your output coupling coil up and down can get the matching correct as in the V1 set? The reasons are that we've changed to a crystal earpiece, so we need that efficient d.c. path to ground instead of a bleed resistor. It also reduces losses due to diode Vf by keeping the signal voltage in the demodulator higher overall. Also, the output coil position should be less critical as we've brought the demodulator stage up in impedance, closer to what would be required for connecting directly across the tank. I've actually used this quite successfully at low signal levels connecting directly across the main tuning coil, but the tuning does become a bit wide. A good compromise might well be to connect the diode about halfway up the main tuning coil. Removing the transformer and using a bleed resistor gives better audio quality particularly at the lower end. For an aerial coupling coil I have used another LW coil when operating on LW for main tuning and another MW coil when using MW for main tuning. I think there is an element of double resonance going on there with the position of the aerial coil affecting the tuning a little and vice-versa. If you don't want to do that I suggest winding plain insulated wire on a cardboard former until you have enough turns. You have enough when putting more turns on doesn't make it any louder and begins to make it quieter when the aerial and main coils are close together. A similar rule applies for the output coil. These are all preliminary results based on quite low signal levels, where my Benny has no real effect and maximum output coupling is required to get some fairly meagre sound. I'll be trying to improve the aerial situation at home after which I will be able to be more specific about some issues. For the moment, I can say that this V2 set with the crystal earpiece works better with a small aerial than the V1 so I'd hope that it is also louder in better operating conditions. 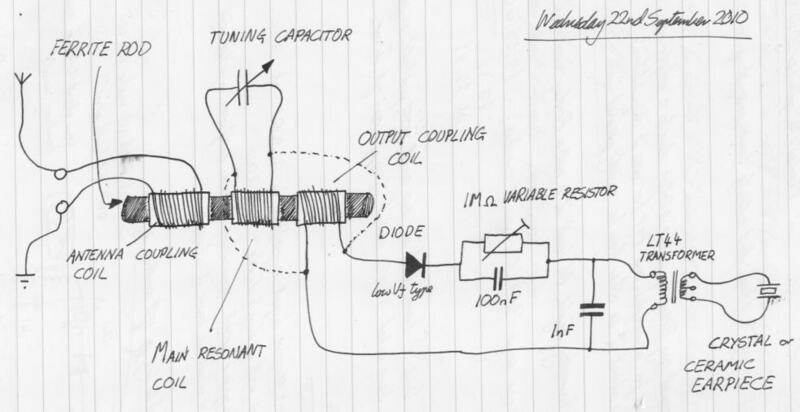 In the picture at the top of the page and the one directly above, you can see that I ended up taking the output coupling off as a tap from the main tuning coil rather than having a separate coil, for this set with the output transformer and ceramic earpiece. In the end it didn't make much difference and the final arrangement with the tap was just more convenient.